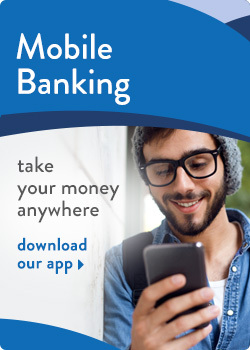 Access your accounts from your smart phone or tablet with free Mobile Banking. To use Mobile Banking you must first establish an eBanking ID & Password. You will also be required to register each mobile device using the email you have on file with the credit union. If you have questions review our Mobile Banking Frequently Asked Questions or call our Member Service Center for assistance. Update or download Community Financial Mobile Banking App from Apple Store or Google Play and you will have access to our Remote Deposit Capture service – Mobile Deposit. Mobile Deposit allows you to use the camera on your phone to take a photo of your check and deposit it into any checking or savings account – free of charge. Checks deposited through Mobile Deposit must be endorsed with "For Mobile Deposit Only." For more information, review our Mobile Deposit Frequently Asked Questions and give it a try today! This service is free but standard text messaging & data rates apply from your communication service provider. Google Play™ is a trademark of Google Inc. App Store is a service mark of Apple Inc.